Care For Earliest Preemies Improves, But Low Birth Weight Remains Risky : Shots - Health News Even very tiny preemies sometimes turn out OK, as shown by the stories of two girls who were among the smallest preemies to survive. But infants born very early and weighing very little can face a lifetime of health problems. It's the kind of news that parents of a premature baby would grasp at: One of the world's smallest preemies, born weighing a mere 9.8 ounces, is now a 22-year-old college student who's living a normal life. But doctors who deal with low birth weight babies say parents shouldn't think that sort of bright future is assured. "It's very dangerous to make this out to be a wonderful success," says Phyllis Dennery, chief of neonatology and newborn services at the University of Pennsylvania and Children's Hospital of Philadelphia. The reality is often quite different. Just 1 percent of babies born weighing less than 500 grams at birth (about 1 pound), are free of physical and developmental problems at 18 months of age, according to an article published in the latest Pediatrics. Even this success story comes with caveats. The girl in question, Madeline Mann, was the smallest surviving preemie when she was born at 26 weeks gestation in 1989. Now a senior in college, Mann weighed just 65 pounds at age 20. A second girl described in the article, Rumaisa Rahman, was born in 2004 weighing just 260 grams, and remains the world's smallest known surviving preemie. She, like Madeline, had normal motor and language development at age 3. But these cases are the exception, not the rule, Dennery cautions. "People say, 'Oh you're so small, you survived, that's great.' Well, maybe if you have some consequences, that's not so great." Since the 1980s, improvements in care for preemies and extremely-low-birthweight infants have meant that more survive past birth. Eight to 10 percent of all babies in the U.S. are born too early, before the 37th week of gestation. And doctors are starting to realize that as preemies and low-birthweight babies grow up, they face greater risks of diabetes, hypertension and heart disease. But small and preemie are not always the same thing, Dennery says, even though both are bad for babies. "You can be born full term and be too small," she says — less than 5 1/2 to 6 pounds. That can be caused by a mother's smoking, problems with blood flow to the placenta or genetic factors. "We tend to think that prematurity is a problem that the minute you walk out of the nursery it's over," Dennery says. "That's the furthest thing from the truth. More and more studies are coming out that there are long-term consequences of prematurity. If you look at lung growth, brain growth, these are all altered by the fact that you are born too early. 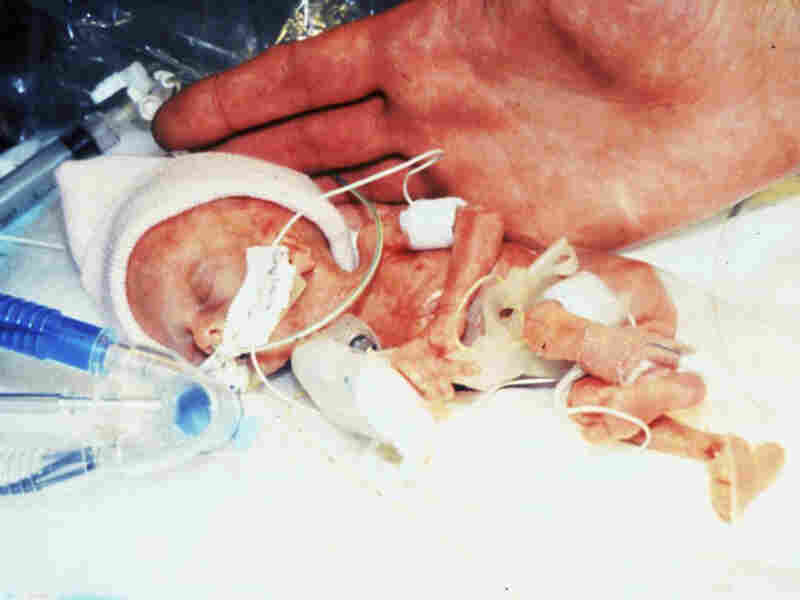 Prematurity is with you for the rest of your life." The authors of the Pediatrics article caution parents and doctors against having false hopes based on these two girls' very unusual stories. But it's hard to imagine that if they knew about them, parents of a newborn preemie wouldn't be hoping that their child would be a lucky one, too.